NYCTA R-62 electric subway train. This train for the 42nd Street Shuttle consists of 4 permanently coupled motorized cars. In other cases, an R-62 unit consists of 5 permanently coupled motorized cars. Driver's stand with digital speedometer (see text at Misc. below), manometer (pressure gauge) and pilot lamp. The power handle and the break handle are both moving and follow the simulation in OpenBVE. 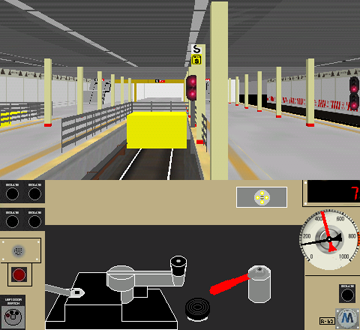 The digital speedometer indicates the speed in km/h, but the permissible speed indicators in the New York subway indicates permissible speed in mph.